Most importantly, recent organizational developments concerning the Sansha Maritime Militia demonstrate a new professionalization and militarization of China’s elite maritime militia forces. Indicators of increased professionalization include hiring recently separated veterans, standardization and enhancement of training, and in some cases lack of clear fishing responsibilities in return for payment of salaries. Key indicators of increased militarization include preparations to make small arms rapidly available to deploying units according to mission requirements, construction of new bases, deployment for non-commercial purposes, and introduction of new classes of vessels with dedicated weapons and ammunition storage rooms, reinforced hulls, and water cannons. Significantly, the Sansha Maritime Militia is being created from scratch using personnel that receive extremely generous guaranteed salaries—seemingly independent of any fishing or marine industrial activity on their part, a dedicated arrangement that we have not seen elsewhere. This represents a significant departure from what we have described previously regarding the maritime militias at Sanya, Danzhou, and Tanmen. These militias were formed and evolved over years if not decades, drawing upon the community’s resident skills and resources. The majority of such militia members engaged in fundamentally civilian economic activities with occasional additional purposes assigned through a People’s Liberation Army (PLA) chain of command, including military law enforcement-style activities. While these three elite militias remain important to Chinese “rights protection” activities, Sansha City’s new, purpose-built militia may in the future be even more so. With logistics and maintenance facilities, as well as family housing, Woody Island has been transformed into something akin to a regional hub base. Other facilities in the Paracels offer the Sansha Maritime Militia sites to deploy for rotational operations. The Sansha Maritime Militia’s organizational structure is increasingly military-like. It is formally organized and operated in a joint, three-layer structure that incorporates China’s three major sea forces, with maritime militia forces on the front line, Coast Guard forces on the second line, and China’s naval and military forces as a third line backstop. Finally, the Sansha Maritime Militia may have front-line responsibilities in the Spratlys in addition to its responsibilities in the Paracels. Alternatively, it may serve as a model for the development of another new leading militia specific to that area, much as the Sansha Maritime Militia seems to have drawn inspiration in part from the Tanmen Maritime Militia. Sansha City Mayor Xiao, who led a delegation to inspect the Tanmen Maritime Militia on 15 November 2013, is in fact a former Party Chief of Qionghai City—the county level city that administers Tanmen Township. He served there from May 2000 to July 2002, which placed him in a position of responsibility for the development of the Tanmen Maritime Militia. This experience likely gave him some degree of familiarity with the dynamics of local militia building, skills that may later have assisted him during the buildup of the Sansha Maritime Militia. The Sansha municipality and a divisional-level PLA garrison were created on 24 July 2012. This involved reorganizing what were previously small “Paracels Militia” (西沙民兵) platoons established by the Paracels Working Committee into the new Sansha Maritime Militia. Lu Le, a Paracels Militia member since 2003, proclaimed that the reorganization catalyzed considerable change, including greater intensity and specialization in training. The scattered fishing communities that live permanently and semi-permanently in the Paracels often hail from different areas, raising challenges for maritime militia organization. The fishermen were not steadily present on the islands and returned to disparate cities along China coasts. To preserve cohesion among the maritime militia and among the residents on the islands, the Sansha City government provides fishermen with stipends and other material support to encourage sustained habitation there. In early 2016 Mayor Xiao stated that the Sansha City government spends ten million RMB (approx. $1.5 million USD) annually to support fishermen transitioning to more permanent livelihoods on the islands in response to deteriorating fish stocks and declining incomes. The government pays stipends to people living on the islands in amounts varying by their island of residence. For example, each person living in the Crescent Group earns 45 RMB ($6.79 USD) per person a day, providing they stay on the islands for 180 days of the year. Those residing on Mischief Reef for 150 days of the year earn 80 RMB ($12.07 USD) per day. Various government-provided benefits foster a more permanent population and generate a relatively stable community from which ranks of the maritime militia can be drawn. Efforts to populate the islands have benefited the maritime militia. The force was relatively small when Sansha City was established, with only two maritime militia companies—each responsible for protecting a portion of the islands and reefs in the Paracels. Expanding mission requirements led to an expanded force. Now there are six maritime militia companies with more than 1,800 personnel and 100 fishing vessels. 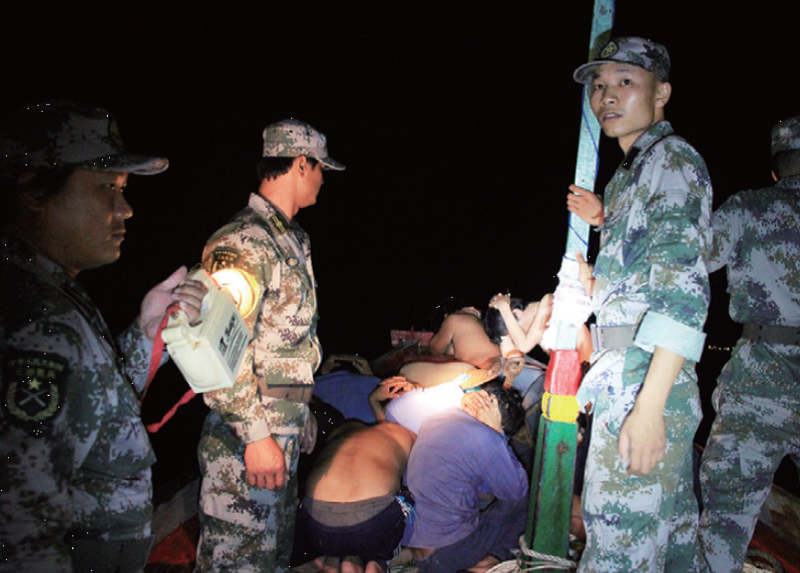 Sansha fishermen have also joined a “law enforcement coordinating team” composed of 30 personnel and five boats. Between its inception and June 2015, the Sansha Maritime Militia conducted 228 missions to report information, expel foreign fishing vessels, prevent foreigners from landing on the islands, and conduct rights protection and stability maintenance. According to Garrison Commander Cai Xihong, Sansha City’s civilian and military leaders and the maritime militia were recognized for their role in what they refer to as the “Zhongjiannan Security Operation” (中建南安保行动). Chinese maritime forces conducted these maneuvers south of Triton Island when China’s HYSY-981 oil rig was placed in the Zhongjiannan Basin in May 2014. The Sansha City and Garrison leadership established a sea command post and sent a command and coordination group to the China Coast Guard’s “forward command post at sea” (海上前线指挥所) to coordinate efforts among the maritime militia and other task forces operating in the “theater” (战区). While confrontation erupted around HYSY-981, Sansha’s Maritime Militia forces were also engaged in protecting other areas of the Paracels from encroachment by foreign fishing vessels. In support of this “security operation,” militia members reportedly confiscated short-wave radios and binoculars from detained foreign fishing vessels. As has been observed in other operations involving China’s maritime militia, the former Guangzhou Military Region issued mobilization orders to local commands in Hainan Province which in turn mobilized maritime militia units from various localities to participate in this security operation. Sansha City’s close proximity to the site of the Chinese operation around HYSY-981 suggests the reason why the theater command required Sansha City to commit Maritime Militia resources to the joint effort. While coordination occurred and the Sansha Maritime Militia reportedly completed its portion of the operation, it remains unclear exactly what tasks Sansha’s Maritime Militia performed. While stationing militia units on the islands and reefs and using the militia units to patrol around them remain priorities, efforts are underway to establish a state-owned maritime militia fishing fleet that can work in more distant waters at the behest of the government of the People’s Republic of China (PRC). Accordingly, the Sansha City Fisheries Development Company (三沙市渔业发展有限公司) was established in February 2015. Authoritative sources demonstrate that this company is explicitly meant to serve as a maritime militia organization to “develop maritime rights protection capabilities” for Sansha City. According to an article in the June issue of National Defense magazine, the Sansha City Fisheries Development Company will organize its vessels into maritime militia units as follows. “The fisheries company will form a flotilla (支队), subsidiaries will set up squadrons (大队), production [groups] will set up companies (中队), and individual vessels will be squads (区队).” (The characters of each unit-level are included because of inconsistent translation of Chinese terminology for units.) 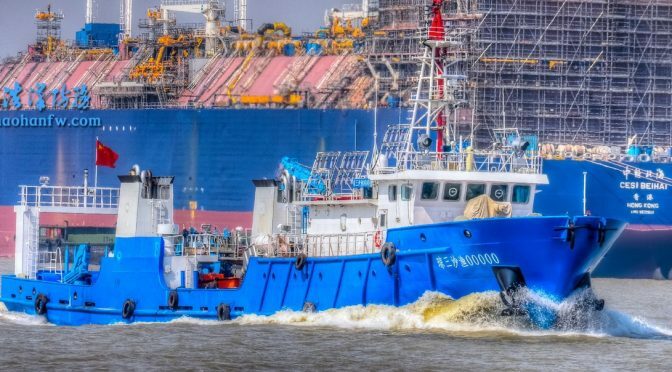 The fisheries company will also establish its own People’s Armed Forces Department (PAFD), primarily responsible for managing the “steel-hulled militia fishing vessels.” This fisheries company is different from more commercially oriented fishing enterprises that apply to enter the maritime militia. An online job recruitment posting for this company notes that hiring military veterans is a priority for all positions on board each vessel and offers substantial salaries. Paying a salary represents a departure from the widespread practice by which income is paid as a share of the vessel’s catch plus fuel supplements and performance bonuses. This departure suggests two things. First, that China is professionalizing some units of the maritime militia. And second, that the parent companies may essentially be front organizations, rather than primarily commercial enterprises. Under this new rubric, ‘patriotism’ pays well for Sansha militiamen. For example, the position of crewmen (水手) advertises an annual salary of 90,000 RMB ($13,494 USD). This compares very favorably to the average annual net income of a Hainanese fishermen, which stands at only 13,081 RMB ($1,961 USD) according to China’s 2014 Fisheries Yearbook. The same posting advertises an annual salary of 170,000 RMB ($25,489 USD) for captains, which is highly competitive by Chinese standards and provides far greater purchasing power than the same salary in the United States or another Western economy. Each advertisement also offers insurance, retirement, medical, unemployment and living benefits for every position, referred to as “five social insurance and one housing fund” (五险一金) according to the standards of similar enterprises under Hainan’s State-owned Assets Supervision and Administration Commission of the State Council. Regular maritime militiamen are typically compensated by local governments for income lost due to service or training, and incentivized with preferential treatment, Party membership, subsidies and potential pensions; but do not receive a salary. Thus, compensation for regular maritime militia units does not match the compensation of a salaried position aboard these new vessels. Furthermore, when juxtaposed with the salary of a second lieutenant (Platoon Leader) in the PLA Ground Force of around 36,000 RMB ($5,413 USD) as reported by the People’s Daily, the relatively high salaries advertised by the Sansha City Fisheries Development Company indicate that China is devoting tremendous resources to hire professional maritime militia personnel. As reform of the PLA forces the retirement or separation of 300,000 of its personnel, positions in the Sansha City Fisheries Development Company offer continued service, a competitive salary, and robust social welfare benefits, seemingly without relation to any catch performance. The career trajectories of two individuals who are current Sansha Maritime Militia members—Xu Zhuang (许状) and Liu Jianqiang (刘坚强)—serve as useful examples. Xu served in Fisheries Law Enforcement starting in 1994, but applied to join the Sansha City Fisheries Development Company in 2014. He won the position of captain within the newly forming militia fleet. When Xu led a trip to the Spratlys in November 2013, he reported a foreign fishing vessel approaching one of the PRC features and assisted maritime law enforcement forces in expelling the vessel. Liu served in a PLA Army vessel transport unit until he was demobilized three years ago. He has since joined the ranks of the Sansha Maritime Militia. Although construction has not yet started, one proposal submitted to the Hainan Provincial Government in early 2015 reveals a great deal about plans to build up this state-owned militia fishing fleet. The proposal involves development of a new port to act as a strategic rear area for Sansha City, specifically to act as a logistics base for the 84 militia fishing vessels allocated to Sansha City by Hainan Provincial authorities. According to the proposal, ten of these vessels were delivered in 2015, with 70 more expected to be delivered in 2016. Concerned about the fragile environment of Woody Island and the inability of Hainan’s other fishing ports to support this large militia fleet, the proposal makes a case for the appropriation of 20 sq. km of coastal land in Wenchang City’s Puqian Township on Hainan Island’s northern coast, to be designated as a strategic rear area for Sansha City. Hainan Governor Liu Cigui, deputy governor Mao Chaofeng (head of the leading small group overseeing the project) and Sansha City Mayor Xiao Jie have all verified that this project is receiving “special preferential policies.” Currently in the planning phase, the project is also included in the 2016 Hainan Provincial Government Work Report. That the project is included in these reports indicates high political support for the project’s construction as part of a larger plan to develop the Mulan Bay area. The port facility will likely be equipped to support the operations of the Sansha Maritime Militia fleet, with specifics yet to be determined. Until the new port is built, the militia fleet remains based out of the various fishing ports of Hainan. For example, the Yazhou Central Fishing Harbor that opened 1 August 2016 provides ample mooring for some of the Sansha Maritime Militia. The link embedded here contains aerial footage of the fleet moored at Yazhou Central Fishing Harbor. Map depicting locations mentioned in this article. Source of original baseline image: Sansha City Government. In keeping with his position as local Party-State leader, Mayor Xiao Jie appears to be spearheading development of the Sansha City Fisheries Development Company. In October 2015, Xiao hosted a forum with prominent private fishing companies from Hainan and other provinces to foster cooperation and learn from their experience. One of the six key points Xiao made was to strengthen cooperation in maritime rights protection. In demonstrating his leadership role, Xiao inspected the company in early July 2016. Reflecting the PLA practice of having political instructors of company-sized units also serve as company Party branch secretaries, political instructor Zhang Jun (one of the company Party branch secretaries) pledged to resolutely execute the guidance of General Secretary Xi Jinping and the Central Party while working in the South China Sea. With six of the company’s Party branch secretaries in his meeting room, Xiao emphasized the fishing company’s responsibility to protect China’s maritime rights and interests. This structure of six Party branch secretaries corresponds to the six company-sized units of maritime militia reported by Garrison Commander Cai in June 2015, further indicating that the Sansha Fisheries Development Company is a dedicated, professional maritime militia organization. 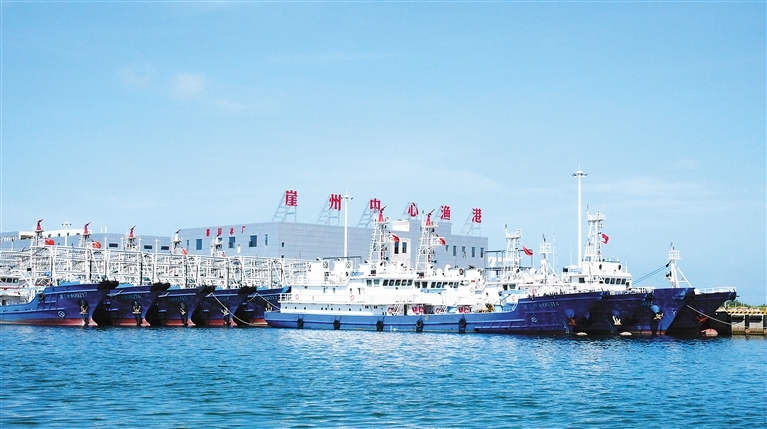 Photos of newly-built Chinese fishing vessels with hull designators “Qiongsanshayu” (琼三沙渔), indicating that they are fishing vessels belonging to Sansha City, have recently received attention on Chinese Internet websites. They look quite different from the average Chinese fishing vessel, bearing comparatively robust hull designs with additional rub strakes (“rub-rails”) welded onto the hull’s steel plating aft of the bow. Such pronounced rub strakes are generally uncommon on Chinese fishing vessel hulls and appear to be added to mitigate damage from potential collisions. These vessels also possess mast-mounted water cannons. Both features could facilitate more aggressive close-in tactics, such as shouldering, ramming, and spraying. For instance, Captain Lu Wei of Sansha City’s Comprehensive Law Enforcement Ship No. 2 complained in May 2015 of difficulties in pursuing foreign fishing vessels as they are no longer permitted to board and inspect them. His only resort is to issue verbal warnings and to use the ship’s water cannon, which, due to the limited agility of his larger ship, is unable to stay on target. Luckily for Lu and his colleagues, Sansha Maritime Militia units are equipped to fill this gap in “maritime rights protection.” They are able to continuously harass foreign vessels with water cannons thanks to their tighter turning radii and shallower draughts, allowing them to sustain such harassment even when foreign vessels seek refuge in the shallows surrounding disputed features. Demonstrating additional official demand for maritime militia vessel capabilities, Hainan Provincial Military District Commander Zhang Jian wrote in the October 2015 edition of National Defense that priorities for fishing vessels in the maritime militia will be based on larger displacement steel-hulled boats that can reach higher speeds and can sustain collisions (抗冲撞). Existing Chinese fishing vessels already clearly outclassed Vietnamese fishing vessels when they clashed near the HYSY-981 oil rig in May 2014. The features of these new vessels can further ensure that neighboring states’ fishing fleets are repelled successfully in future confrontations. One of the shipyards constructing Sansha’s Maritime Militia fleet is a subsidiary of China Shipbuilding Industry Corporation. 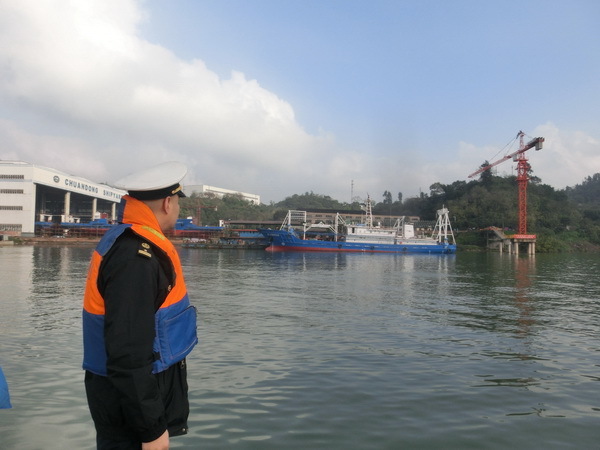 Chongqing Chuandong Shipbuilding Industry Co., Ltd. (重庆川东重工船舶有限公司), located in Sichuan Province far up the Yangzi River, has constructed a large number of Sansha City’s new fleet of fishing vessels. Several navigational warnings issued by China’s Maritime Safety Administration indicated that the twelve hulls listed below left the shipyard and were towed down stream between 16 December 2015 and 3 February 2016, a span of less than two months. The shipbuilding technology service company Guangzhou Taicheng Shipbuilding Industry Co. Ltd. (广州市泰诚船舶工业有限公司) provided interior furnishing for the vessels produced at the Xijiang and Wenchong Shipyards. The page displaying its furnishing work for a vessel produced by the Xijiang Shipyard describes a “weapons and equipment room” (武备室) and “ammunition store” (弹药库) on the main deck of the vessel. 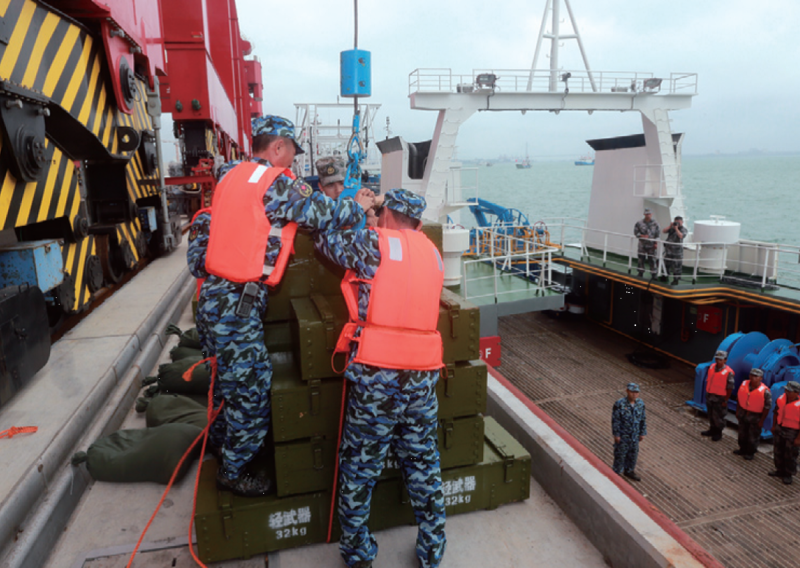 Additionally, the image below appeared in a June 2015 feature article on Sansha City in National Defense showing Sansha Maritime Militia members loading crates labeled “light weapons” (轻武器) onto one of the newly delivered fishing vessels. While China’s Maritime Militia is ostensibly an unarmed force, it is apparent that, at a minimum, preparations are underway to arm at least some of its vessels. A new fleet of vessels is only as effective as its crew. Operating on the front-lines of disputed maritime claims, Sansha’s Maritime Militia will need enhanced training and discipline to conduct its assigned missions. Garrison Commander Cai explains that personnel receive training collectively and in smaller groups while stationed on islands, covering topics such political education, reconnaissance, rescue, “assisting in rights protection” and “shooting at sea.” Sansha Garrison Chief of Staff Li Zhaofeng told reporters in January 2016 that Sansha Maritime Militiamen were sent to a training base in Northern Hainan to receive military training. According to Li, they must pass evaluations in subjects on navigation, communications, fishing practices, and legal regulations before they are allowed to sea. Such efforts will be necessary for the maritime militia units to be effective enough to integrate with PLAN and CCG vessels to execute joint defense of China’s maritime claims. 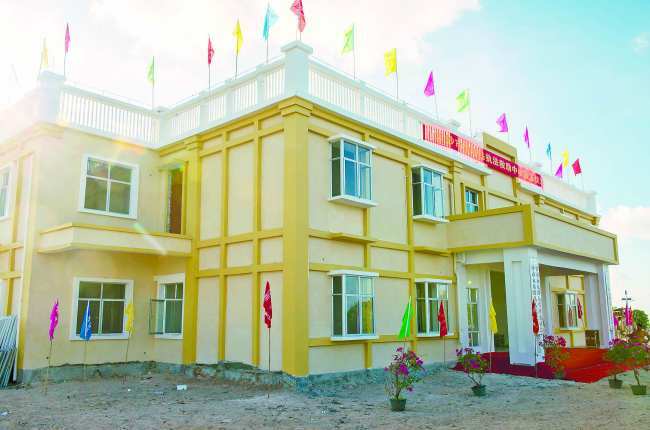 An important priority after Sansha City was established was to form the civil-military institutional structures for Party leadership and national defense building in the South China Sea. Institutions established by Sansha City include its National Defense Mobilization Committee (国防动员委员会), Ocean Defense Committee (海防委员会), Military Facility Security Committee (军事设施保护委员会), and a Double-Support Work Leading Small Group (双拥工作领导小组). A routine of military affairs meetings (议军会) also began. “Double Support,” short for “support the army and give preferential treatment to military families, and support the government and cherish the people” (拥军优属拥政爱民), is a policy based on a reciprocal civil-military relationship whereby military and local civilian work units reinforce each other. For example, military units can assist in local construction projects while local governments help facilitate military exercises. These arrangements help ensure Party control over the military in Sansha City, facilitate Party-State-Military cooperation in military-related construction efforts throughout Chinese-occupied features in the South China Sea, and foster valuable synergies between PLA forces and the civilian population. 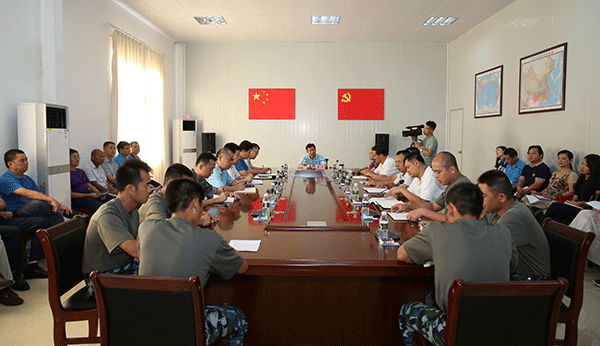 Present at many of these meetings, Sansha City Mayor Xiao Jie is fulfilling his responsibility as First Party Secretary of the PLA Garrison’s Party Committee. He must work alongside Garrison Commander Cai Xihong and Political Commissar Liao Chaoyi (廖朝毅) to ensure that local military work and construction of the reserves is included in the city’s overall planning, which prominently features matters related to Sansha’s Maritime Militia. There may be no other city in present-day China where the military and civilian populations are so closely linked. Sansha has a high troop-to-civilian ratio stemming from the city’s extremely small population. Not surprisingly, the resources of the central government and military are critical to Sansha City’s development. These dynamics won Sansha City the title of “National Double-Support Model City”—an award for municipalities that provide exceptional support for the military—received by Mayor Xiao in Beijing on 29 July 2016. An important role for militia units based in China’s border and coastal regions is the participation in military-police-civilian joint defense (军警民联防), a concept included in three of China’s recent Defense White Papers (2013, 2010, 2006). Joint military-police-civilian defense applies Mao Zedong’s People’s War concept to the peacetime security of border and coastal regions through combined use of the PLA, local security or law enforcement forces, and the militia. Sansha City organizes its border and coastal defense in the form of joint defense involving the Navy, Coast Guard, and Maritime Militia. Such efforts aim to improve coordination between the military and local forces to create three lines of operation for maritime rights protection—a “first line of militia, a second line of administrative law enforcement, supported by a third line of the military.” Manning a first line to advance China’s objectives while limiting escalation, maritime militia forces can confront foreign vessels under support provided by China’s Navy and Coast Guard. Employment of this three-tiered structure of force demonstrates an official institutionalized approach to integrating China’s three sea forces. This concept is the subject of ongoing discussion in the PLA and is already put into practice by such localities as Sansha City. Given the concept’s evolving status, it is unclear how successful it would be if executed as envisioned as a full spectrum of operations. One particular weakness may be command and control in real time in a contested environment. Essential to managing the maritime militia, PAFDs were reportedly established on several South China Sea islands in January 2015, each of which reports to the Sansha City Garrison. Proliferating in step with the expansion of PRC grass roots governance structures, they are located on three Paracels features: Woody Island (永兴岛), Tree Island (赵述岛), and Drummond Island (晋卿岛). Further south in the Spratlys, a PAFD was established at Fiery Cross Reef (永暑礁). Subordinate to China’s Provincial Military Command system, PAFDs are the local PLA organs established in military sub-districts, counties, cities, districts, townships, and enterprises that are responsible for local PLA recruitment and registration work, supporting demobilized troops, and organizing and training the militia. The scant population inhabiting Woody Island and other PRC-occupied features means these PAFDs must be primarily engaged in militia and defense mobilization-related work, rather than conducting the PLA’s grassroots work with the masses. Operational command of the militia belongs to Sansha City Garrison, while the PAFDs are responsible for the regular command and training of Sansha’s Maritime Militia. Additional PAFDs may be established in the future on other PRC-occupied Spratly features. Mischief Reef, for instance, hosts a maritime militia “flag-raising squad,” indicating that elements of the Sansha Maritime Militia are already stationed there. Sansha City has devoted considerable resources to bolstering its joint defense infrastructure on the islands and reefs in the Paracels. According to Mayor Xiao, Sansha has invested over 40 million RMB ($6 million USD) to construct a joint defense command center, officially beginning construction on 25 July 2015. It provides joint command, training, management and “combat readiness materials storage” (战备物资存储) functions. The project supports information sharing and provides the facilities for the unified organization of maritime law enforcement. 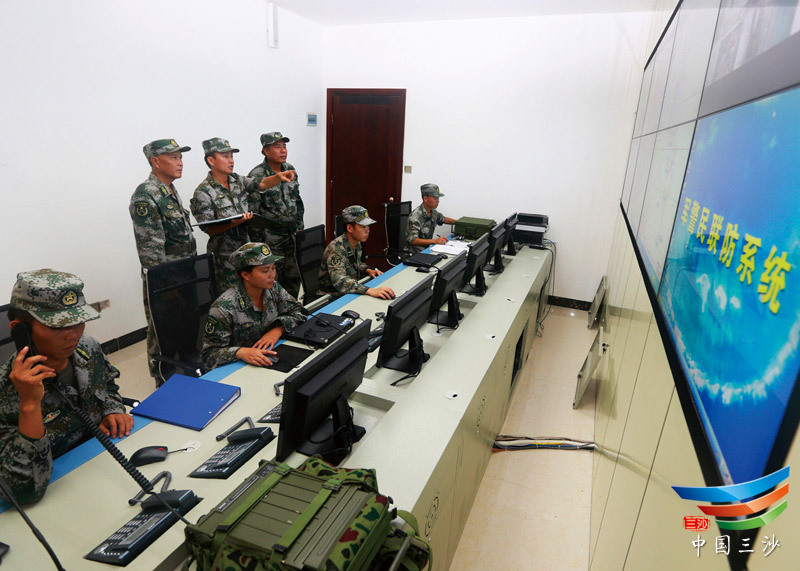 Some personnel of the Sansha Maritime Militia are receiving training on how to man this joint defense command center, as depicted below. The exact extent to which command and control is exercised over forces in the South China Sea from this center remains unclear. Local militiamen are assigned the important task of manning militia outposts (民兵哨所) established in border and coastal areas around the country. From these outposts, militia units conduct patrols and defensive missions, and monitor the surrounding areas. Such outposts help secure China’s remote regions and act as eyes and ears for the PLA. 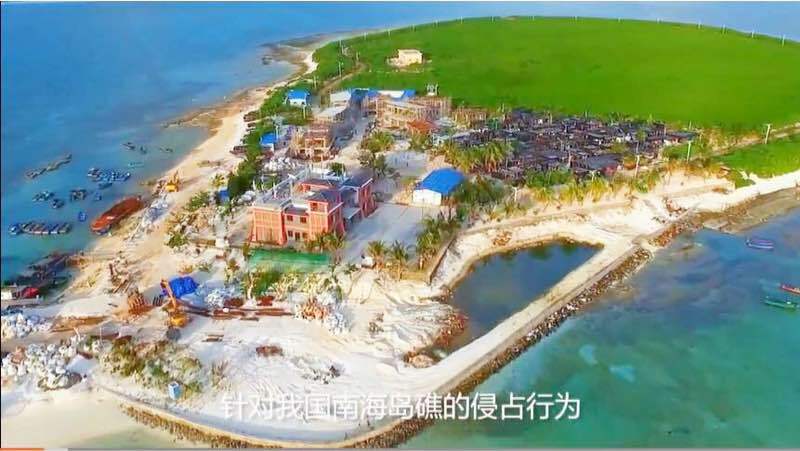 On the edge of China’s contemporary frontier, Sansha City’s military authorities are also building militia outposts to secure PRC-controlled islands and reef areas. On 24 July 2015, Sansha City built its first “informatized ocean defense militia outpost” (信息化海防民兵哨所). It is manned around the clock by the maritime militia stationed on Tree Island. This militia outpost supplies data to the joint defense command center on Woody Island and is supported by growing communications infrastructure throughout PRC-occupied islands in the South China Sea. The outpost also reportedly tracks targets in the surrounding seas using AIS, marine radar, and video surveillance. These outposts are built within multi-purpose buildings that also house the PAFDs. Sansha’s civilian and military authorities plan to construct more militia outposts to “upgrade capabilities in maritime rights protection, administrative control of sea areas, and emergency response and rescue.” Drummond Island has also completed its militia outpost and PAFD building and has been approved as a future logistics base. In short, these military functions are being performed by organized professional units often dressed as civilians. 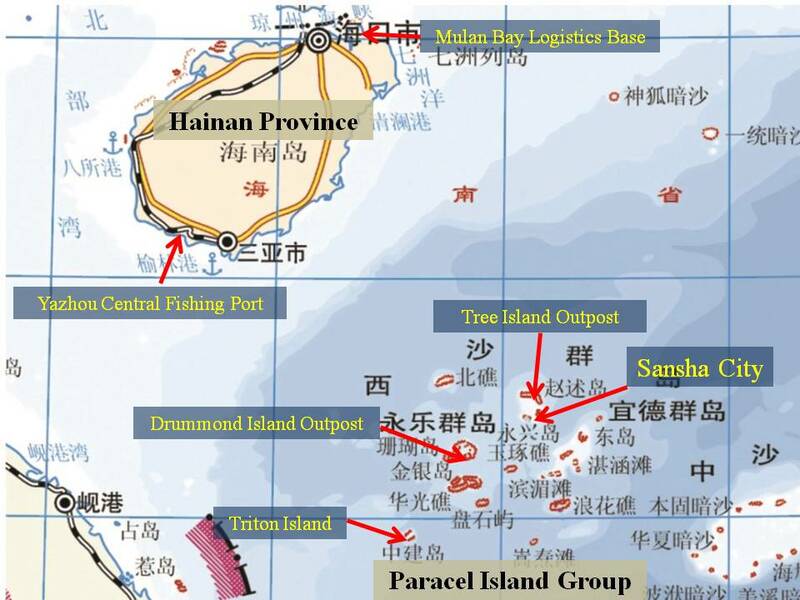 Documentation of Sansha Maritime Militia activities and infrastructure in the Paracels Island Group is relatively clear. Chinese open sources reveal much less about related activities in the Spratlys, especially on or around the features China built up since 2014. The PRC has stated clearly that these outposts will support China’s fishing industry, but has not acknowledged the existence of China’s Maritime Militia within this context. As this dynamic unfolds, the Sansha Maritime Militia and its newly assembled fleet of dedicated vessels is the most important unit to watch. By decree, it is responsible for patrolling and defending China-claimed features in the Paracels, Macclesfield Bank, Scarborough Shoal, and the Spratlys. In future incidents involving the maritime militia in the South China Sea, the Sansha Maritime Militia will likely be the ‘go-to’ unit that Chinese authorities will entrust to enforce claims and confront foreign vessels. Sansha City is making great strides to construct a maritime militia capable of manning and defending PRC-occupied features and venturing into the surrounding seas to uphold China’s maritime claims backed up by the PLAN and China Coast Guard. In preparing to fulfill these sweeping responsibilities, the Sansha City Militia is even more militarized in structure, forces, and character than its elite counterparts in Sanya, Danzhou, and Tanmen. This elite, professional unit is formally integrated into a joint operational structure incorporating all three of China’s major sea forces: the maritime militia, Coast Guard, and Navy. Within this layered conglomerate, Sansha’s Maritime Militia is charged with operating at the front lines and engaging foreign vessels directly, ideally achieving Beijing’s objectives without the other two forces needing to intervene. To this end, it is being professionalized and militarized to an unprecedented degree. This series covering Hainan Province’s Maritime Militia explores key local units in-depth, exposing much of the details of this inadequately understood tool China uses to uphold and further its maritime claims. The next and final article will examine Hainan’s development of the maritime militia at the provincial military district level, and provide insight into the future course and trajectory of China’s Maritime Militia. Conor Kennedy is a research assistant in the China Maritime Studies Institute at the U.S. Naval War College in Newport, Rhode Island. He received his MA at the Johns Hopkins University – Nanjing University Center for Chinese and American Studies. Featured Image: Two to three different classes of these fishing vessels are in production, although their functional differences remain unclear. The vessel depicted above is produced in fewer numbers and with a significantly different design, suggesting a functional specialization. Image source: Twitter.